The top story in this period was reactions to her being named as John McCain’s running mate, which garnered 24% of election coverage. 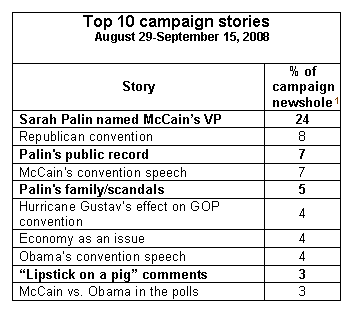 Stories about Palin’s family, including her daughter’s pregnancy, made up another 5% of the campaign newshole, while the governor’s public record accounted for 7%. The “lipstick on a pig” skirmish occupied another 3%. These news stories have raised Palin’s religion, and its implications, as part of her profile, but quite often, in-depth reporting of Palin’s religious biography have only been included as details below the lead. Even the media’s coverage of her personal life—including her choice to give birth to a baby with Down syndrome—did not translate into analysis of the policy implications of her values or in-depth consideration of the belief system that informs her choices. As with election coverage across the board, strategy, political and horserace news have dominated. But attention to family-related topics ranked at No. 5 and accounted for 5% of this coverage—a sizeable portion when considering the relative lack of reporting on policy issues. Religion and abortion policy as news topics registered much lower, at only 1% and less than 1%, respectively, in the campaign coverage about Palin. Some of these themes have occasionally been picked up by the mainstream media, including opinion pages and profile pieces, although they have not generally been the focus of the reporting. Amy Sullivan, a religion reporter for TIME, wrote a Sept. 6 article called “Are Evangelicals Really Sold on Palin?” Liberal pundit Rachel Maddow’s new show on MSNBC has addressed the issue of separation of church and state, and whether or not a Palin vice presidency could jeopardize that. Earlier, on Sept. 4, both CNN and the Associated Press produced stories suggesting that the McCain campaign has been playing down the governor’s Pentecostal roots.